850352 Snowtrooper Key Chain is a Classic Star Wars Key Chain set released in 2004. 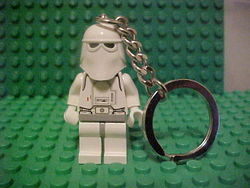 This is the same set as 4224469 Snowtrooper Key Chain. Facts about "850352 Snowtrooper Key Chain"
This page was last edited on 9 January 2016, at 23:19.